Asbestos is an environmental hazard that attained near-mythical proportions a couple of decades ago when a slew of regulations were passed limiting its production. But confusion still seems prevalent regarding what asbestos is, how it is dangerous, and how to avoid it. Asbestos refers to a group of six different minerals commonly used in various products, especially building materials, insulation, and brakes for automobiles. Chrysotile, which is found in everything from plasters to floor tiles to fabrics, is the most widely used of the different asbestos types. Asbestos minerals are known for their strength, durability, and resistance to fire, which makes them perfect candidates not only for skyscrapers and other buildings, but also for shipbuilding and fuse boxes. While products containing asbestos are not harmful in and of themselves, microscopic particles found in these materials can become a serious health hazard when airborne. The tiny, durable asbestos particles get lodged in lung tissue and cause scarring that results in asbestosis, a disease which inhibits breathing. In many cases, lung cancer will eventually develop. People with prolonged exposure to asbestos are largely at risk, but any exposure can be severe. Studies have also shown that smokers are more likely to develop cancer as a result of their exposure to the particles. While the use of asbestos has been banned in many products, including an impending ban in automotive brakes for 2014, hazardous materials can still be found in numerous applications including roofing, textured paint, and insulation containing vermiculite. The best way for a person to protect against asbestos inhalation is to become educated on the different types of materials that may be hazardous, then learn whether or not their living space was constructed using any of those products. If so, breaking, handling, or setting fire to these materials will greatly increase risk of exposure, and should be avoided. 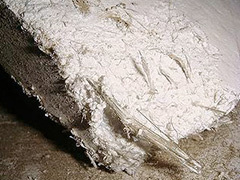 Additionally, workers and manufacturers in the fields of construction, shipbuilding, and other industries where exposure to asbestos may be unavoidable, are protected by strict measures that require employers to provide protective clothing and head gear, preventative training, and regular medical examinations. These workers should voice concerns about possible asbestos exposure to their employers, as well as their doctors and government officials. Posted on January 8th under Global Ecology.